The NRA would have us believe that “Guns don’t kill people. 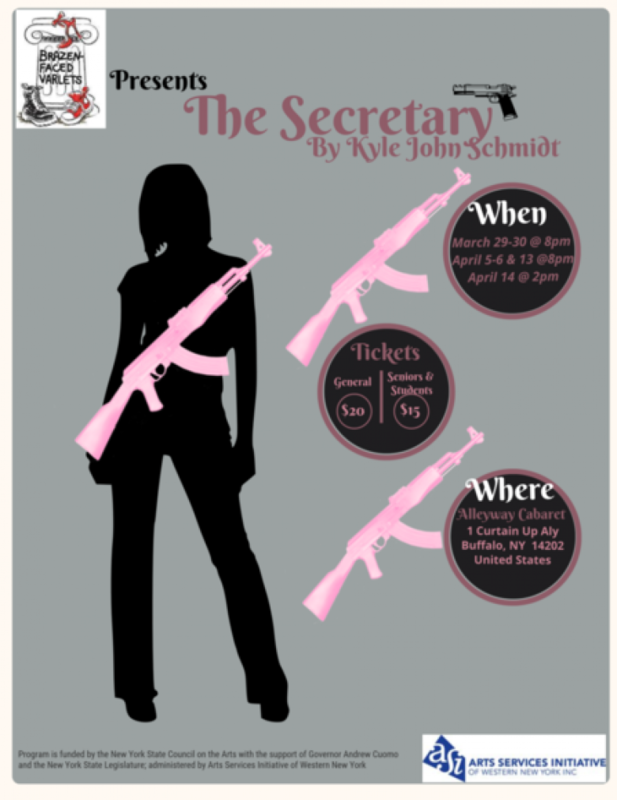 People kill people.” In The Secretary, a black comedy that dissects the American love and hate affair with guns, playwright Kyle John Schmidt turns that slogan 180 degrees and takes us on a funny, sad, and scary journey that is unnerving, to say the least. What if guns do kill people...? This very thought-provoking play speaks to the complexity of the cultural debate about gun ownership, to the very personal terror and grief of people subjected to violent attack, to the desire for revenge of survivors, to the lives that will not be lived by those who were killed, to domestic violence, and to the fascination and seductive quality of the power one might feel when carrying a gun. 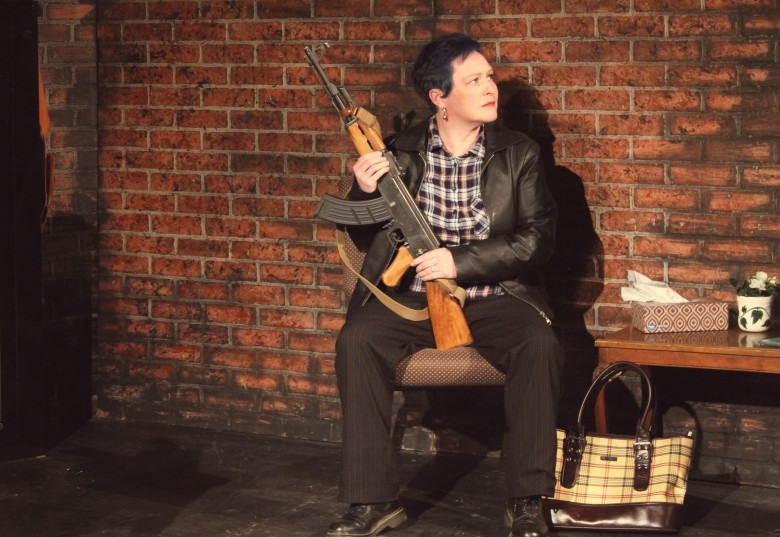 As the play begins, a middle-aged woman named Ruby (Davida Evette Tolbert) owns a very successful small town business in the Midwest that produces guns. It might be called a boutique business, for each of her guns is specifically designed to honor a woman who used a gun to fend off a violent attack. Mall-walker and Babysitter are two such deadly items. Another factory in town has closed and 40 people are seeking work at the gun factory, but sales are slowing down, and Ruby tells her office manager, Janelle (Caroline Parzy-Sanders) that the business cannot take them on. Janelle responds that her church is praying for a “big event” because sales always rise when there is a mass shooting somewhere—a fact that Mr. Schmidt noted about the ammunition factory in his own home town during an interview. As luck would have it, the big event occurs right in their town. Ruby is interviewing a secretarial candidate, April (Stefanie Warnick), who is opposed to the mass use of guns but desperately needs a job. The two women have been arguing for their positions at some length when Janelle enters and excitedly informs Ruby that there have been gunshots at the school. They ultimately find that the school secretary, the very nervous Shirley (Jeannine Giffear), has shot and killed a student. Why? What really happened? Ruby immediately creates a new gun, an assault rifle, she calls The Secretary. She hires a good-old girl, Lorrie (Heather Fangsrud), for the secretarial position, and Lorrie begins to carry the rifle in the office. The police refuse to allow Shirley to have a gun, so she comes to Ruby for help with that problem. The child’s mother, Brandy (Jamie Nablo), also seeks help from Ruby. Each of the six women has a backstory that fleshes out their character and speaks to their choices and impulses in relation to the use of guns. There is a great deal of talk about safety and protection, while all but April ignore the very real danger that mass use of guns poses to the individual and society. Director and Artistic/Executive Director of Brazen-Faced Varlets, Lara Haberberger, who is expert in staging plays in small spaces, does a fine job here. Ruby’s office is the setting. Scene changes are quick and minimal, with just a few items being replaced or removed, so the flow of the story is not interrupted. With some hiccups, the acting is of high quality. Davida Evette Tolbert gives a very strong performance as Ruby. She inhabits the character of a dominating company CEO, making her demands clear to her subordinates, expressing her exasperation in no uncertain terms when these demands are not met, while also being compassionate for others’ pain, and ultimately conveying the anger, helplessness, and grief of a mourning mother. Heather Fangsrud is chillingly funny as good old-girl Lorrie. Her combination of savvy and pretend-innocence, deadpan facial expressions that hold a hint of menace, and backwoods accent are quite a treat to watch and, like the play itself, unnerving. Caroline-Parzy Sanders's performance as Janelle is rather uneven. At times she seems to be reaching for lines, while at others she is spot-on, as when she describes her excitement about waiting for that “big event” and in some of her heated exchanges with Lorrie, who she despises. Stephanie Warnick is very good as April, the outlier in this gun-dependent town. She hates guns, loves die-ins, and has painful secrets that gradually unfold. While initially seeming like a bit of a flake, Ms. Warnick holds her own in arguments with the dominating Ruby and gradually shows us her character’s underlying strength. Jeannine Giffear is a bit over the top as the high-strung gossip, Shirley. However, her role also requires her to be both obsequious and manipulative, two traits that so often go hand in hand, and which she projects quite well in her sly way. Jamie Nablo is very good as Brandy. She freely expresses the feelings of the furious, grief- and poverty-stricken mother who loved her troubled son, while at the same time also has her eye on Ruby’s compassion and money. Ruby says, “If you have a gun, you have safety,” that you are secure. Helen Keller stated, “Security is mostly a superstition. It does not exist in nature, nor do the children of man as a whole experience it…” Will our country continue this current almost obsessive pursuit of safety and security that seems to be an exercise in futility that only leads to more violence, which leads to more obsession about safety and bigger, more powerful weapons? Or will it be possible to take a step back, as they recently did in New Zealand, and reassess and change the way we relate to these weapons? Brazen-Faced Varlets has created a forum for that discussion in their production of The Secretary that is very entertaining as well as provocative. You can see it in the The Cabaret space at Alleyway Theatre through April 14th. Theater lover, psychotherapist, founder of Cultivate Joy Within, former actor, school owner, etc.